Warning: today's blog post has one isolated instance of naughtier-than-usual language. Proceed at your own risk. Tomorrow morning, a Saturday, is a rare day for my planner. The Saturday square on my monthly events/appointments calendar - empty! Just a blank square, with nothing that I HAVE to do for the whole entire day. On one hand, I plan to watch a season of Gilmore Girls (thank you Netflix! ), read some trashy romance novels, and maybe work on one of my own books (none of which are even close to ready to submit for publication). Maybe I'll make some "slutty coffee" (which is the VERY INAPPROPRIATE nickname one of my best friends gave to my cafe au lait with a splash of hot chocolate, LOUD ENOUGH FOR THE WHOLE COFFEE SHOP TO HEAR). (Yes, shouty caps were completely justified.) Or I might go for a walk. But my planner is not a useless part of this gloriously relaxed day. In addition to a potential task list, my daily MUST DOs are on a sticky note. Honestly, I could skip one little day of those and survive, though. 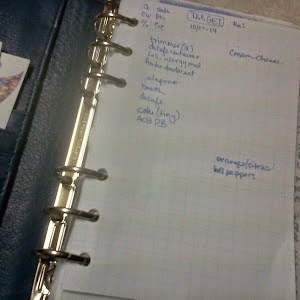 I'll also use my planner as we run out of groceries, to add to my list. 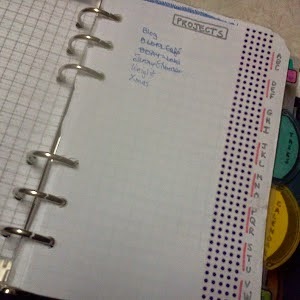 And my project pages will be where I record my calories and workout. Saturday is my cheat day, but I still like to track. 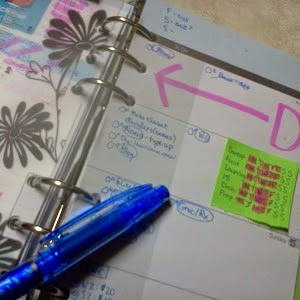 I might use my weekly menu for dinner ideas or my notes section to look up at-home exercise days. I might like the author of my book and jot a note about that on a book ideas page. A planner is not just a calendar. It's a working tool intended to help you accomplish, remember, and, yes, even relax.